Uniquely burdensome taxes and fees make Illinois unfriendly to entrepreneurs, and drive businesses and families out of state. Entrepreneurship is the embodiment of the American Dream, and through their creativity and hard work, entrepreneurs bring new ideas, products and ways of doing things to the marketplace, often building businesses generating significant numbers of jobs. Fostering entrepreneurship is especially important for Illinois, which has experienced lackluster jobs growth and an unemployment rate that surpasses those of its neighbors. 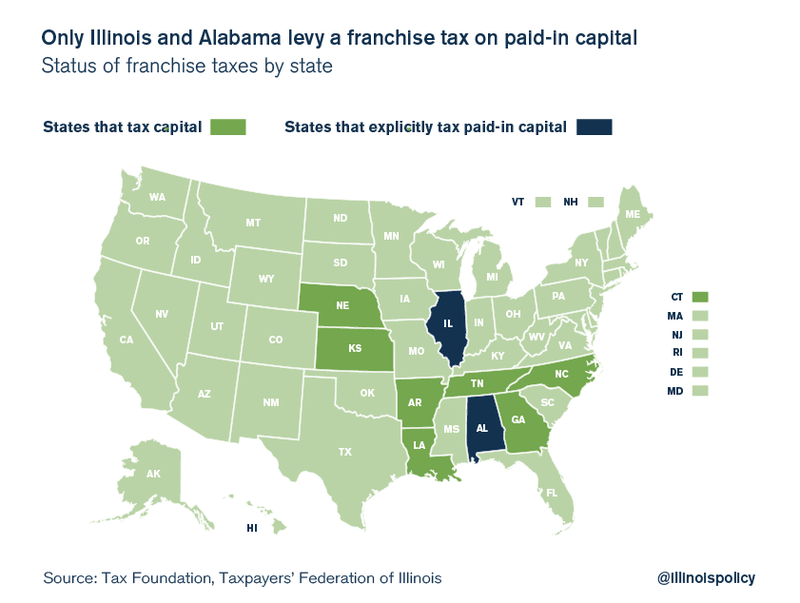 Yet, Illinois punishes, rather than encourages, entrepreneurs through its corporate franchise tax, death tax and limited liability company, or LLC, startup filing fees. Lawmakers should repeal these taxes and slash LLC fees to make Illinois a welcome home for entrepreneurs and the jobs they create. The cost of compliance is high relative to the revenue raised. Compliance might even cost the economy more in lost productivity than the tax raises in revenue. The tax is far more burdensome for smaller businesses and start-ups than it is for established corporations. It taxes investments in Illinois in a perverse way, which drives away job-creating investments. The tax is extremely outdated and makes Illinois appear slow to adapt public policy to the modern economy – which is not a good image for a state seeking to attract innovators and new businesses. 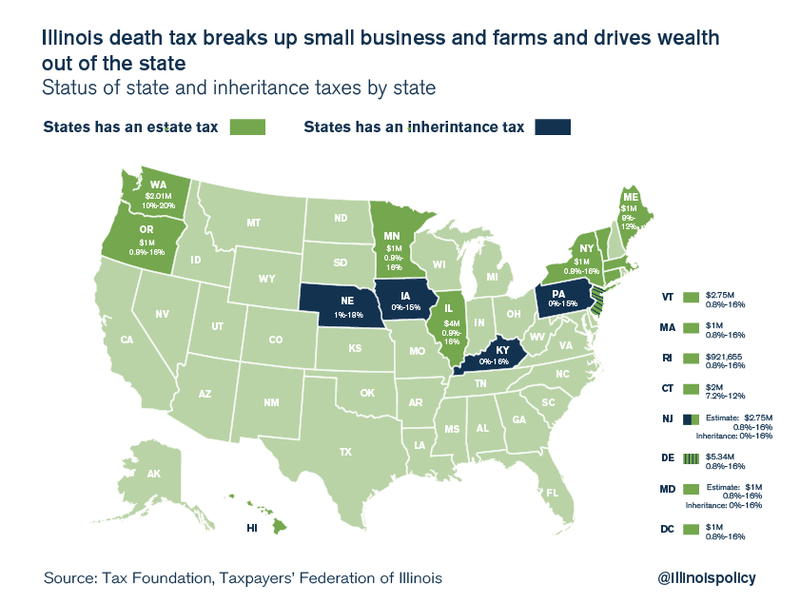 And Illinois’ estate tax, better known as the “death tax,” also hurts entrepreneurs and their businesses. The death tax in Illinois takes 16 percent of the estate of wealthier individuals beyond a certain exemption. It is an obvious driver of out-migration of wealthy business owners. No Southern state has a death tax, because they know wealthy retirees don’t want to move to states with death taxes. The estate tax takes a chunk of a productive working business assets or a farm and turns it into a one-time cash grab by the government. It’s an obvious driver of out-migration of wealthier families and business owners. The tax can easily be avoided by moving businesses and wealth out of the state. The tax is unfair to farmers who can’t avoid it, and it breaks up family farms. The tax costs Illinois jobs when businesses and business assets move over the border to avoid it. It amounts to double taxation because it falls on businesses and assets that have already been taxed at the income tax level. This is unfair and creates an excessive drag on the state economy. Illinois has ridiculously high LLC start-up fees. The high-fee schedule brings in little revenue for the state, but it puts up a huge red flag for entrepreneurs. Those who do start an LLC in Illinois are punished with a $500 fee just to file their papers, and are hit up for another $250 per year every year after that, simply to continue filing forms with the state. The combined start-up and annual filing fee in Illinois is $750, far and away higher than the same combined-fee schedule in surrounding states. These fees should be dramatically slashed for several reasons. Illinois LLC fees are simply anti-poor. It’s easy for a rich entrepreneur to pay them, but it’s difficult for a poor entrepreneur to cough up $500 just to file papers. 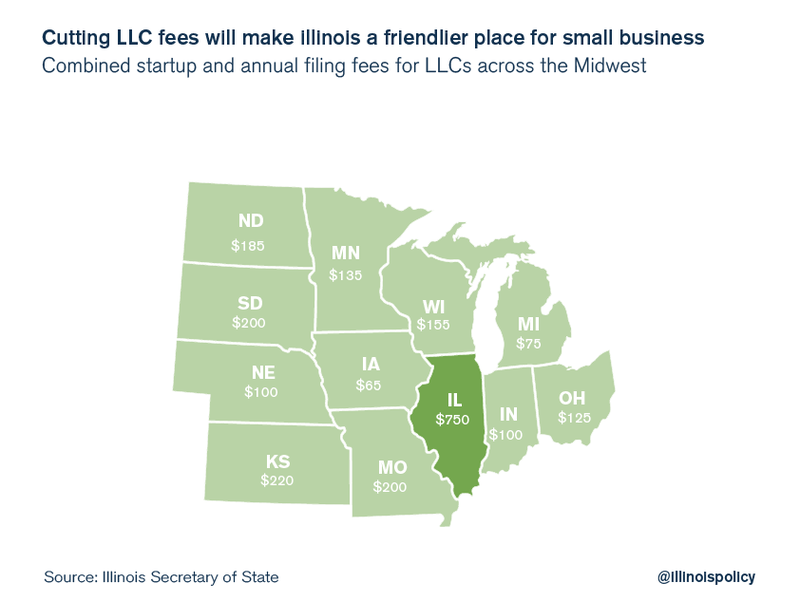 The ridiculous LLC-fee schedule makes Illinois look especially unfriendly compared to neighboring states. A fair fee for filing paperwork should be the cost for the state of processing that paperwork. This is one of the easiest changes Illinois can make to foster entrepreneurship. Illinois needs to keep the overall tax burden as low as possible to relieve its already over-burdened families and business community. In addition, the way Illinois taxes and collects fees should be fixed, starting with rolling back the parts of the tax code that punish entrepreneurs. The way to do that is to eliminate the corporate franchise tax, repeal the death tax and slash LLC fees.